Wilson also created two subsidiary organizations, the U. S. Grain Corporation and the U. S. Sugar Equalization Board. This groundbreaking WWI legislation was created to enforce and regulate food consumption and production in WWI America. State and national governments called upon household consumers, food producers, and farmers to “eat less” and “be thankful that we have enough to share with those who fight for freedom.” As head of the Food Administration, Herbert Hoover wrote, “The whole great problem of winning the war rests primarily on one thing: the loyalty and sacrifice of the American people in the matter of food.” The Administration launched the “Food Will Win the War campaign between the years of 1917 through 1919, promoting moderation mostly through propaganda (or “publicity”) since Congress prohibited rationing. National Archives and Records Administration, Records of the U. S. Food Administration. allies in Europe and the Americans living and fighting there during WWI. By the time America entered the war in April 1917, European demand had exhausted food reserves and driven up prices. Since farmers could not increase production until the following year’s harvest, it became obvious that America would have to conserve food if it was to continue to feed not only itself, but its expanding army and allies. As seen in the “Eat More, Eat Less” poster published by the U.S. Food Administration, Americans on the home front were encouraged to eat less wheat, meat, sugar, and fats so that these items could be sent to the U.S. army and allies stationed in different parts of Europe. Citizens were not only encouraged to eat less of these foods but were also encouraged to prepare and serve substitutes such as fish rather than beef or offal instead of the more familiar cuts of meat. 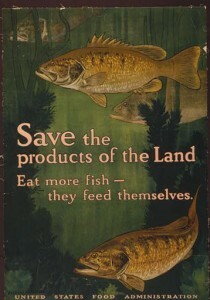 Pictured right, this poster urges people to eat more fish in order to conserve beef. Investigating and sharing the types of American foods that were available in WWI France and other European countries helps us better understand daily life as it was experienced by volunteers, nurses such as Alma A. Clarke, and American soldiers like Frank R. Steed, who were living and fighting there. Combining themes of famine, women, children, and war, this poster proclaims that saving wheat will help feed the women and children of France. 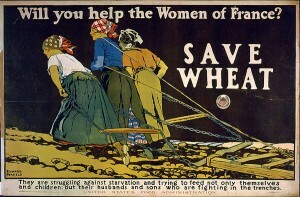 Food history provides an opportunity for developing a better understanding of broader WWI topics such as war propaganda, the Franco-American alliance, the role of women in the war (both at home and abroad), and a number of historical contexts such as political history, military history, and economic history. Wartime posters and advertisements are extremely valuable as visual and textual resources for a food history study of WWI. Cafer du Plessis, Elizabeth. “MEATLESS DAYS AND SLEEPLESS NIGHTS: FOOD, AGRICULTURE, AND ENVIRONMENT IN WORLD WAR I AMERICA.” PhD diss., Indiana University, 2009. Hendee, A., Paul Stahr, Charles Edward Chambers, George Illian, artists. U.S. Food Administration (USFA). Educational Division, Advertising Section, 1917, in NARA’s Still Pictures Records Section. Special Media Archives, College Park, MD. National Archives and Records Administration. Records of the U. S. Food Administration, Record Group 4. Penfield, Edward, George Illian, Jack Sheridan, Montgomery Flagg, artists. U.S. Food Administration (USFA). Educational Division, Advertising Section, c.1917 and National War Garden Commission, c.1917. National Archives and Records Administration, Still Pictures Records Section, Special Media Archives: College Park, MD. Ponder, Stephen, . “Popular Propaganda: The Food Administration in World War I,” Journalism and Mass Communication Quarterly 72:3 (1995): 539-550. Accessed November 13, 2015. “Member of United States Food Administration.” ca.1917 – ca.1918. U.S. Food Administration Documents, AG15 Box 8. Herbert Hoover Presidential Library. West Branch, Iowa. Poster artists: A. Hendee, Paul Stahr, Charles Edward Chambers, George Illian, U.S. Food Administration (USFA), Educational Division, Advertising Section, 1917, in NARA’s Still Pictures Records Section, Special Media Archives, College Park, MD. Elizabeth Cafer du Plessis “MEATLESS DAYS AND SLEEPLESS NIGHTS: FOOD, AGRICULTURE, AND ENVIRONMENT IN WORLD WAR I AMERICA,” (PhD diss., Indiana University, 2009); “Member of United States Food Administration,” ca.1917 – ca.1918., U.S. Food Administration Documents, AG15 Box 8, Herbert Hoover Presidential Library, West Branch, Iowa. Artists: Edward Penfield, George Illian, Jack Sheridan, Montgomery Flagg, U.S. Food Administration (USFA), Educational Division, Advertising Section, c.1917, and National War Garden Commission, c.1917, NARA, Still Pictures Records Section, Special Media Archives, (College Park, MD).